Taste test: These are awesome chips, with the thick cut and wide ridges typical of a Walkers Max chip, and a delicious flavor. 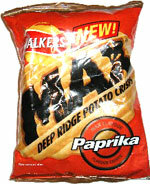 They're by far the best paprika chips I've tried. The flavor is somewhere between a barbecue chip and a ketchup chip, but it's really more than that. These just taste great! Smell test: Smells like barbecue chips.